Investigative Journalist. @FullMeasureNews NYT Bestseller: Stonewalled. Question authority. Think for yourself. Make up your own mind. It's still in progress... hopefully kinks will be worked out next week... but check out the new https://t.co/3duSZQk8eO. I've tried to incorporate your feedback into a new, cleaner design. The mobile site should work better, too! Let me know! Thanks. 3. ...closed her eyes and thought and opened them and said, "You're right." And we did it thereafter. But I don't think it had ever occurred to her or the editors in the chain prior to that point. @glennid10t @WeAreSinclairNot necessarily... I will say Jim Accosta was my colleague at CBS and his reporting as far as I recall was unremarkable/straightforward; he has changed his style at CNN. But someone else would have to explain why, I only notice a difference. @wow_slim1968 @WeAreSinclairYes. I addressed that in my speech today. Many liberal journalists who report fairly have noticed that when they report fairly they are demonized as conservative. 6. The good news? People are getting wise. 1. An exoneration letter is drafted in advance. Poor FBI -- agents who had nothing to do with the improper behavior will have to take a "full day of training" to learn things like: Don't use work texts with your mistress to conspire to use your official position to impact a presidential election. Why is (almost) nobody talking about Trump-Russia collusion? I'm ok either way, I just would like to know why it was the #1 most important story in the world for so long and now it's not. I could be wrong but seems to me you can't logically argue both ways: if they're all good people who deserve to be here; if they add net wealth; if they're more law-abiding than citizens, then how is it a *threat* to place them in certain towns? It's a benefit; a reward.Thoughts? The hits keep on coming. 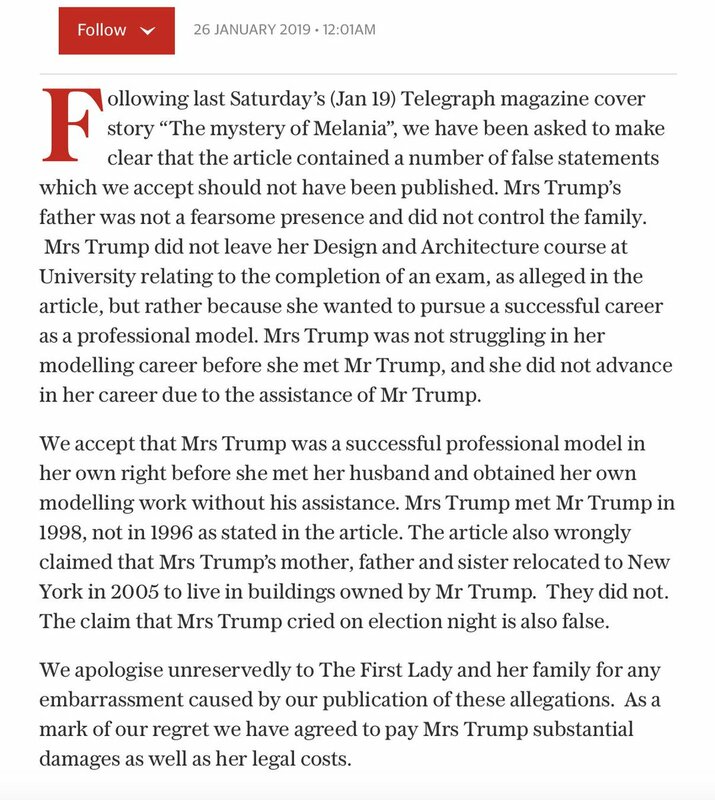 From The Telegraph in the UK: an apology to Mrs. Trump for false reporting.